For the track guidance of Automated Guided Vehicles (AGV). 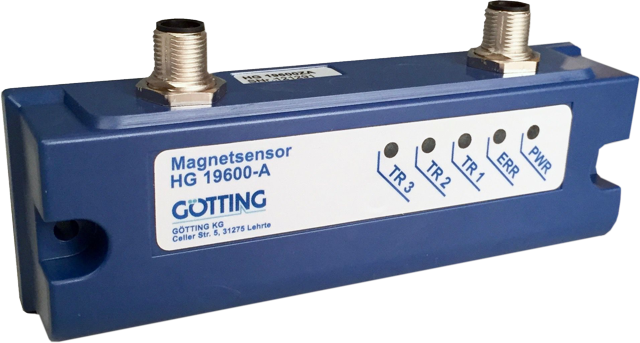 The magnet sensor HG G-19600ZA detects the magnetic field above a magnetic tape in horizontal and vertical direction and continuously calculates the actual deviation diagonally to the direction of travel. The deviation is then output as an analog voltage. The sensor is based on digital magnetometer technology for the detection of the magnetic field above the magnetic tape. This technology is robust and maintenance free. The magnetic tape is easy to install and unaffected by dirt. The sensor contains three independent detection systems. It can thus detect junctions (second track) and follow turnoffs. Via the two digital inputs DIN1 and DIN2 one of max. two tracks underneath the sensor is dynamically selected. Five LEDs show the operating state (PWR), errors (ERR) and a track underneath the individual systems (TR1, TR2, TR3). The detection range depends on the reading height (mounting position of the sensor) and the type of the magnetic tape. As shown in the image above the sensor uses the magnetic flux density to calculate the deviation X of the center of the track. The higher the deviation the higher the voltage generated in the sensor. Via two analog outputs the deviation from the track as well as the current level of the magnetic field are output. Additionally a detect signal is generated when a magnetic tape is detected underneath the sensor.